Pinkberry, credited for launching the modern-day frozen yogurt craze, is testing self-serve machines in two Southern California locations. The do-it-yourself experiment has been ongoing for months at shops in Brea and Burbank. A Pinkberry official played down the test, which comes a few years after Chief Executive Ron Graves said he would never play the self-serve card. At the Pinkberry on Imperial Highway in Brea, the store offers 10 flavors at 49 cents an ounce. The front counter has a bar, where customers can choose from an assortment of fruit and candy toppings. By comparison, a nearby Yogurtland in Brea had a menu of 16 different flavors at 41 cents an ounce. In Burbank, the self-serve option has been around a year, while Brea converted in December. 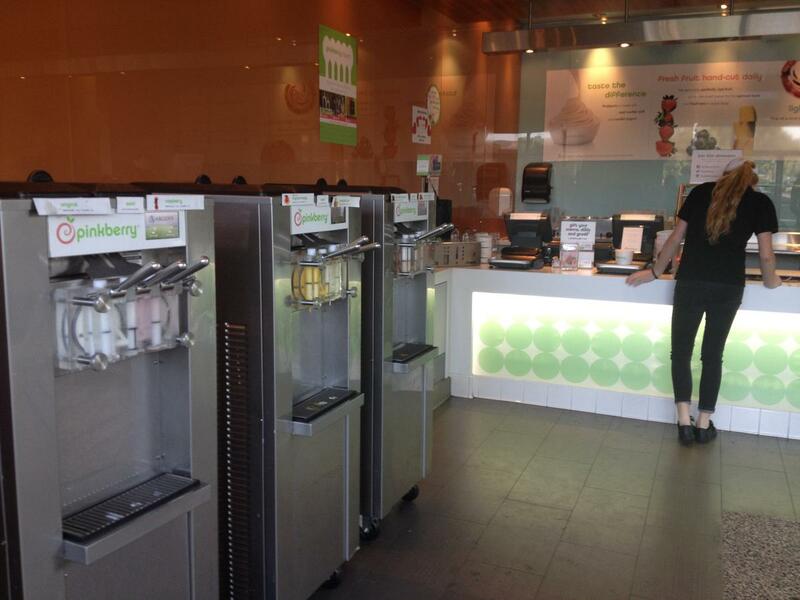 Jakobsen said Pinkberry has no plans to convert more shops. Darren Tristano, a restaurant consultant for market research firm Technomic, said five years ago that premium frozen yogurt chains like Pinkberry “would have great competition from self-serve fro-yo brands” in a post-recession economy. Though brands such as Golden Spoon Frozen Yogurt have been around for more than 30 years, Pinkberry is considered a pioneer in the category. When Pinkberry debuted 10 years ago, it elevated the frozen yogurt category with its slick presentation and tart-heavy fruit flavors. Pinkberry now has 250 shops in 21 countries. Copycat brands have since saturated the market, including Yogurtland, Tutti Frutti and Cherry on Top. To differentiate themselves, many adopted the self-serve model. Their popularity soared among consumers who enjoy controlling how their food is prepared. “The trend in consumer control demonstrated by build-your-own formats is the next generation of customization,” Tristano said. Irvine-based Yogurtland launched its first self-serve store in Fullerton in 2006. It now has about 300 stores in the U.S., Australia, Guam, Thailand, Venezuela and Dubai. “Why? Because that would be letting the competition define us,” he said. History shows it could also be brand suicide. In 2012, Rancho Santa Margarita-based Golden Spoon tested self-serve in a handful of Southern California stores. At the time, the chain said it would eventually convert at least 40 locations to the trendier do-it-yourself shops. But after its loyal customers balked at the messiness of self-serve, the chain halted those plans. This entry was posted on Wednesday, May 27th, 2015 at 3:46 pm and is filed under Economy, Future Plans/Announcements, New Product Tests/Mentions, Price, Yogurt. You can follow any responses to this entry through the RSS 2.0 feed. You can leave a response, or trackback from your own site.